Photo Caption (10/19/2018) Representing Bank of Little Rock Mortgage-Annette Goodall, Grace Hughes, Holley Hoagland, Ambraya Hodges, Katie Roush, Asia Huffman and Representing Bank of Little Rock Mortgage-Bob Goodall. Friday, October 5th during Joplin High’s football game. The students were honored as a part of the Real Proud of Real Eagles program, sponsored by Bank of Little Rock Mortgage. The program recognizes students for their achievements in and out of the classroom. The students honored were Grace Hughes, Holley Hoagland, Ambraya Hodges, Katie Roush and Asia Huffman. Grace Hughes has a 3.96 GPA and serves as editor in chief for the Spyglass. She is a member of the girls swim team and is the boys swim team manager. Grace is hard working, dependable and has a high standard of excellence in all that she undertakes. She assists her church at outreach shelters in the community by preparing and serving food. Grace is the daughter of proud parents William and Maureen Hughes. Holley Hoagland has a 3.72 GPA and serves as the manager for the football team, the assistant editor of the yearbook, historian for Tri-M music honorary and is a member of the Touch of Class show choir. She is creative, dependable, dedicated and quietly outgoing. Outside of the classroom she helps with the Joplin Little Theatre. Holley is the daughter of proud parent Amy Hoagland. peer buddies and a member of Skills USA. She is dedicated, organized and thoughtful. Ambraya helps with Meals on Wheels and wrapping deserving children's gifts during the holiday season. Ambraya is the daughter of proud parent Shawne Hodges. Katie Roush has a 4.0 GPA and is a member of both Touch of Class and Sound Dimension show choirs, International Thespian Society, yearbook staff and Tri-M music honorary. Katie is dedicated, determined, dependable and hard working. She helps with Joplin Little Theater and helped paint houses in Joplin with Habitat for Humanity. Katie is the daughter of proud parent DeeAnne Roush. Asia Huffman always puts full effort into all of her work and consistently comes to class with a great attitude. Asia is a dedicated student who has a pleasant attitude and enthusiasm to do well. Asia always takes the time to make sure she has answered questions and completed assignments to the best of her ability. 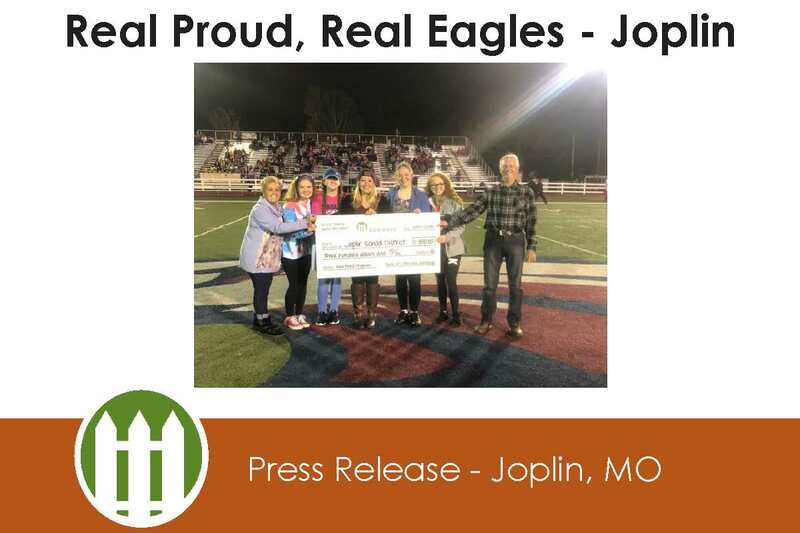 $300 contribution which is part of the $1,500 Bank of Little Rock Mortgage will donate to the Joplin High School this year.